The summer house was a feature in early American design, and examples appeared in both private and public gardens, such as New York’s Central Park. One appears in the 1886 historic “Plan of Olana” and is labeled “Summer House”. Everything on this plan is more or less accurate, yet there is no documentary evidence to support what Olana’s summer house looked like. Its design remains a mystery. Olana is the 250-acre creation of America’s great landscape artist Frederic Church. It is a three-dimensional work of art – an early “earthwork” and American landscape garden – and it’s widely considered Church’s masterpiece. Beyond that, Olana possesses a rare genius loci: it exists in the birthplace of America’s first native art movement, the Hudson River School, and Church was a leading figure in this group of artists. As a large-scale composition, Olana combines varying architectural styles with native woodlands, naturalistic elements, a constructed lake, agricultural fields and far-reaching sublime views. Olana’s landscape has roots in the Picturesque style, combined with 19th century American conservation and wilderness ideas. In honor of Frederic Church’s diverse talents, The Olana Partnership has collaborated with the New York chapters of the American Institute of Architects (AIANY) and the American Society of Landscape Architects (ASLA-NY) to create an exhibition which features 21 visionary designers. 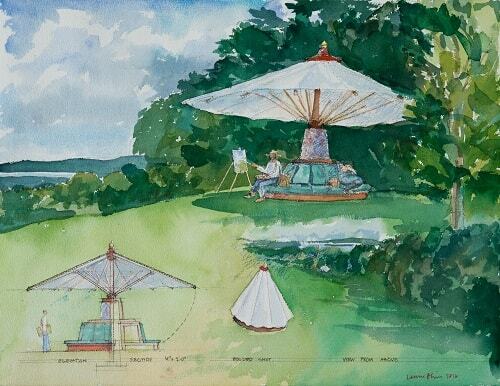 Each designer contributed a concept sketch to address what Olana’s summer house could be, much in the way Church sketched to experiment with design ideas. Follies, Function & Form: Imagining Olana’s Summer House presents architects and landscape architects as artists. Architects and landscape architects often approach projects from different perspectives, yet there is a symbiotic relationship between structures and their surrounding landscapes. 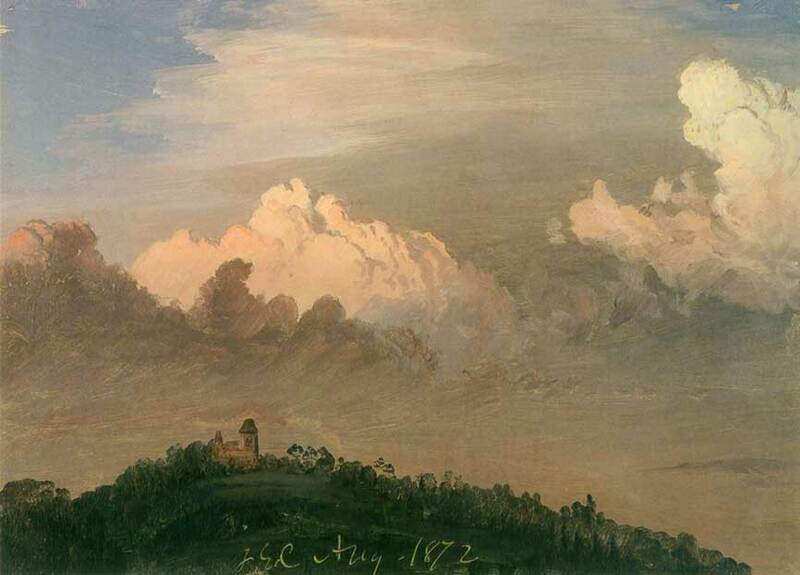 This show serves as a celebration of Olana and Frederic Church, and it also celebrates the two interrelated fields of architecture and landscape architecture. The concept sketches in this exhibition vary in style and execution, yet each designer demonstrates a high level of talent and generosity of spirit, and this is evident in every sketch. Reacting to Olana’s historic setting and iconic topography, the 21 works reflect a 21st century approach to environmental design. America’s past informs its future, and here the future converses with the past. 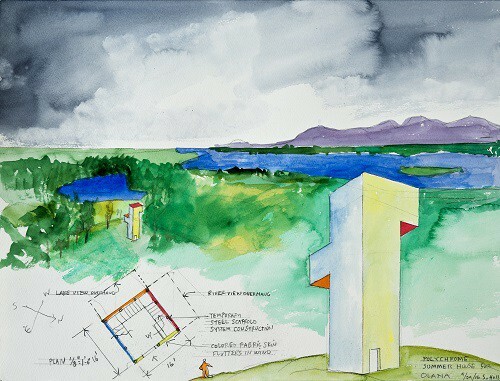 Each concept sketch revolves around a central spatial idea and challenge, and as a group, these collected works reflect Frederic Church’s legacy and Olana’s deep sense of place. This design exhibition runs from August 14 through November 13 in the Coachman’s House Gallery. To learn more click here.